Hallelujah for the largesse of our imaginations! Dear SOULS, I create with all of my truth, tools, and you, my blessed community. May we all enfold our entire BEINGS into our visions, magnifying and manifesting wholeness, expanding LOVE. Today, I want to share with you how I continue to use my imagination to understand and express my truth here on Earth. Recently, I have been truly comprehending what Cynthia Winton-Henry means when she says our destination here on this Earth is being a "little body spirit." As a result, I have all the OUCHES that come along with being SMALL on a very LARGE planet. Since I use the tool of image making to expand and explore my truth, I have made a series of images presented here to address some of the WOUNDING I have been experiencing. 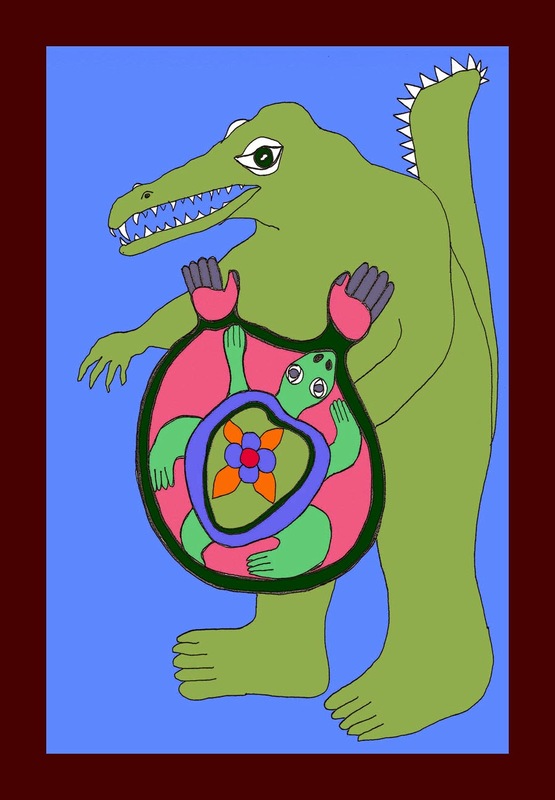 Mother Alligator #1: Then emerged the armor--the shield embodying Wise Ancient Turtle--summoned on my call forth to be whole, healed, and healthy. "What is it you need," both Alligator and Turtle asked. It was once again affirmed for me that we all have the ability to call forth "HELP" from our inner selves. That this "HELP" is somehow connected to the wider universe be it the subconscious and archetypes or what many call the Great Spirit or God. As a meditative process, I invited Mother Alligator to return for four consecutive days. In this way, I could begin with the familiar--Mother Alligator, but be open to any transformation that might like to manifest. Mother Alligator #2: I find comfort in the four-petal flower. In this image, in place of Turtle, Hallelujah Truth has become the shied encompassed in four-petal wonderfulness. 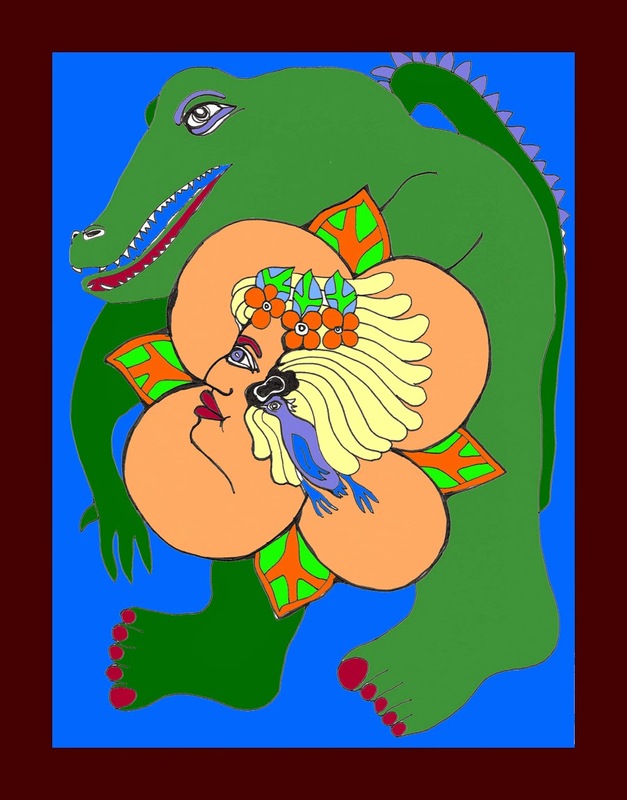 Fierce Mother Alligator by bearing my image, flourishes the depth of love and way of being that I emmanate. Empowered by my symbols, I awaken more fully to myself. My question, "What next?" The answer? Love, heal, and move into the MYSTERY with ease, joyfully. Mother Alligator #3: On the third morning, I emerged next to Mother Alligator, and she whispered in my ear: "Use this shield always! Your heart is protection from illness. Use your heart. Use your vision. Always. Do not retreat from the wisdom of your heart." USE YOUR HEART. USE YOUR VISION. Do not retreat from the wisdom of your heart--whispered Mother Alligator. I AM DANCING MOTHER ALLIGATOR. 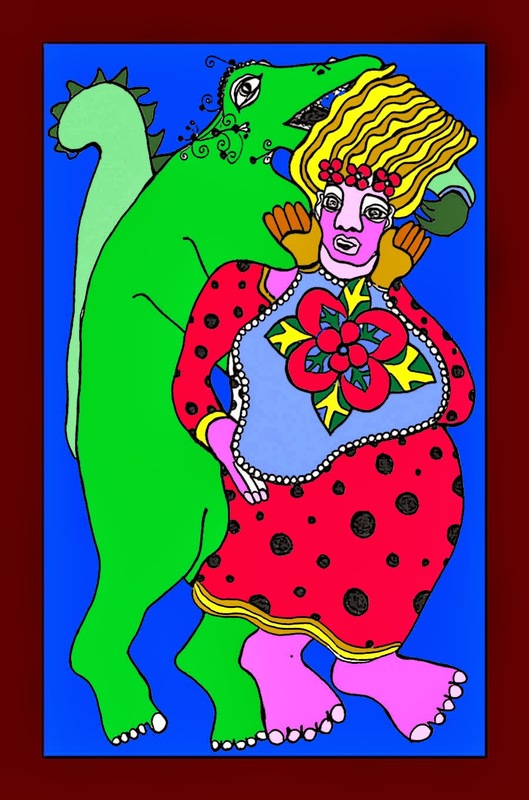 Mother Alligator #4: The last image I drew in this series was "embodying" my "little body spirit" in something larger than myself. 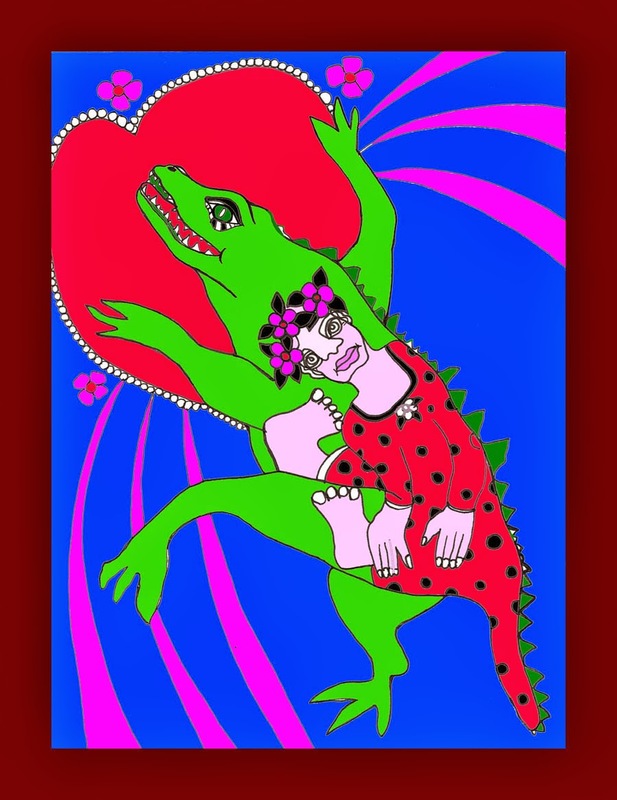 The resource of Mother Alligator, provides me with the fierceness to dance my truth. My HEART is my shield and resource. And knowing that Mother Alligator has survived millions of years because she is resourceful. The SOUL is like this too! Understanding our pain and woundedness is part of our path towards wholeness. That's Coffee with Hallelujah! SOUL BLOG with me and share your experience as "a little body spirit" here on this magnificent Earth. What are your resources? How will you create your truth? Something we should ask ourselves each day, each time and each event.Through your meditative process you are certainly learning and creating who the real Hallelujah Truth is Ruth...I think your images show all so clearly..I can only strive to know and create my truth as clearly as you are creating yours..
Darlene, you are one of the kindest people I have met. Thank you for being so supportive of my journey. Yes, perhaps these questions: Is it kind? Is it necessary? Is it true? --need to be added to our mantra--Not good. Not bad. Just is. Love our connection and appreciate you. Love this blog Ruth and your visions being created in art! Yay for mother alligator and turtle!!! My resources include my soul sisters like you and Mother nature and all her many gifts. I have been calling on Heron Woman for over a year now to facilitate some independence and balance between the worlds. Christine! Thank you for being my SOUL SISTER! And I feel so akin with the heron too! Love you! I really feel the strength and tenderness in the image of heart as both shield and resource...such an empowering symbol in these artworks!